The Time Off Record schedules time off for a specific TeleTracker Online User. All items marked in RED are required fields and must be populated before the Shift can be saved. 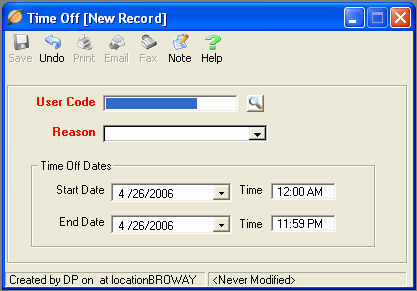 User Code : Enter a Code for the Time Off Record. The Code cannot contain any spaces or special characters. To perform a search for the User Code, click the lookup icon. You may create a new User by clicking the New icon located on the Users Record Viewer. For further information when creating Users, visit the User Master File help file. Reason : Click the Reason drop-down list and select the appropriate reason. Create a Time Off Reason by visiting the Reasons Master File. Be sure the Valid For selection is Time Off. Time Off Dates : Identify the appropriate Start Date and Time and the appropriate End Date and Time. button located on the toolbar.